Del Mar is located just west of the I-5 freeway. Exit Via de la Valle and head west to the Racetrack. For information about parking and to purchase discount vouchers, visit our Ticket FAQs. Parking fees are charged on a per-vehicle basis when entering the facility, cash only. No re-entry allowed. Parking Rates. Special arrangements for personal transportation to and from the racetrack can be made by contacting Skye Limousine Services by phone (619) 239-7599. Skye Limousine services Del Mar, La Jolla, Rancho Santa Fe, and most other areas of Southern California. Besides offering transportation to and from the Del Mar Race Track, they also offer service to and from the San Diego Airport (SAN), Los Angeles (LAX), Beverly Hills, and Hollywood. 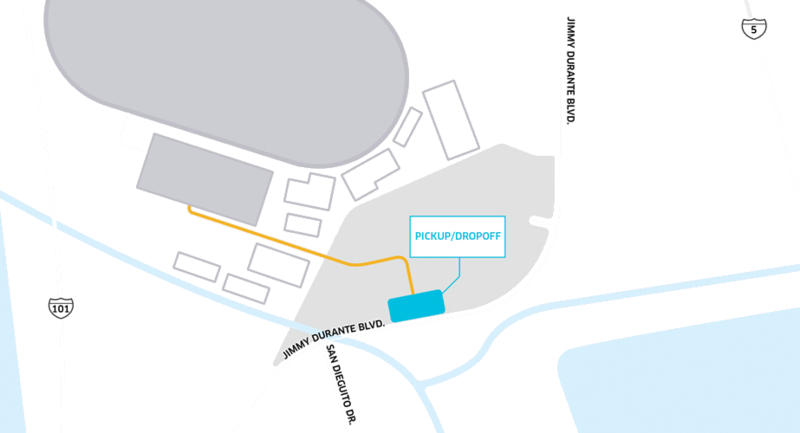 The rideshare dropoff and pickup lot is located on Jimmy Durante Blvd. Please proceed to the lot before requesting a pickup. Taxis line up daily just west of the Stretch Run Entrance during the races. Both Amtrak and Coaster trains stop at the nearby Solana Beach station. Del Mar provides complimentary shuttle service to and from the track. Get off at the Solana Beach station and look for the free double-decker buses. Leave traffic and traffic jams behind. Ride Pacific Surfliner trains to Solana Beach and connect to complimentary shuttles to the racetrack. Book your train reservations today. The Coaster operates along the north-coast of San Diego, from Oceanside to Downtown. The Sprinter operates east & west in North County San Diego, from Escondido to Oceanside, where it connects with the Coaster service that will take you south to Solana Beach. Del Mar Thoroughbred Club to provides complimentary shuttle service for Racing Patrons arriving on Amtrak/Coaster at the Solana Beach Station. Shuttle Schedule. Service from Escondido to Del Mar / Solana Beach. 20 miles north on the I-5 from San Diego International Airport (SAN). 100 miles south of Los Angeles International Airport (LAX) via 405 to I5. The nearest facility for landing private planes or helicopters is approximately 15 miles to the north from Palomar Airport, 2138 Palomar Airport Rd., Carlsbad, CA 92008. (760) 431-1328. ShiftSanDiego.com is a partnership between the San Diego Association of Governments and the California Department of Transportation. Plan your travel to the Track and discover other ways to get there. Use the TripPlanner to compare all types of alternative modes of transportation. Get real-time traffic info to find the most efficient route. Avoid traffic due to construction.